Located some five hundred kilometres north of the arctic circle in the icy Chukchi Sea is the forlorn landmass of Wrangel Island. So remote and isolated is this frozen land that it was not properly mapped until the early 20th Century, and then inadvertently, when wildly over-optimistic explorers washed up, shipwrecked, on its shores. After a couple of abortive attempts at settlement and protracted diplomatic argument, Wrangel Island is now occupied by a small team of Russian scientists and their supporting community who maintain a meteorological and research base at Ushakovskoye on the Southern coast. The little village confirms Russia's on-going territorial claim - one that wasn't properly resolved until 1974. In 1911 the famous icebreakers, Tamyr and Vaygach, as part of the Russian Arctic Ocean Hydrographic Expedition (1910-15) briefly landed a party on Wrangel Island and claimed it for Russia. In 1914, survivors from the Vilhjalmur Stefansson-led Canadian Arctic Expedition' s doomed Northern Party camped on Wrangel Island for nine harrowing months. Their ever-controversial leader had abandoned them in September 1913, leaving them for dead aboard their ship, the CGS Karluk, stuck fast in the ice pack. Not content with that fiasco, Stefansson landed an "occupation" party of five on Wrangel Island in 1921, apparently to assist Canada and Britain in the so-called "northward course of empire". In another epic arctic drama, his experiment ended in tragedy, leaving a brave young Inuit woman, Ada Blackjack, the sole survivor. In spite of this abject failure, another group of Inuit were installed in 1923, but these hapless souls were eventually evicted in 1926 by Russia, setting off yet another dispute that would simmer for years after. A good part of the reason Wrangel Island was chosen for this extreme survival exercise is the abundance of wildlife. Polar bears, walrus, arctic foxes, snow geese, migratory birds and seals populate the immediate region in relatively large numbers. Ironically, Wrangel Island also escaped glaciation in the last Ice Age, leaving several unique species of vascular plants and was probably the last place on Earth to support a woolly mammoth population. Although many of the bones and tusks have been removed, it is still possible to see skeletal remains of these extinct giants scattered across the landscape. Forget the string of courageous, but disastrous attempts by man to colonise, map and exploit this arctic desert and instead examine the immense natural beauty of this seemingly inhospitable environment. That's exactly what the UNESCO World Heritage committee did in 2004 when it included Wrangel Island on their list of global ecological hotspots, describing it as a "self-contained island ecosystem" with "the highest level of biodiversity in the high Arctic". 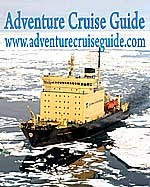 In 1991, the tourist-carrying icebreaker Sovetskiy Soyuz, visited Wrangel Island on the return voyage from the North Pole - and the secret was out. Now this veritable arctic wonderland is a regular inclusion on the itineraries of the world's most adventurous travel operators. Naturalists, ecologists, archaeologists, "twitchers" and regular tourists in search of the unusual are now part of the minor throng that venture north every year from Anadyr in the helicopter-equipped icebreaker, Kapitan Khlebnikov. Being surrounded by ice almost all year, every year, Wrangel Island will always remain on the list of seldom-visited locations and the few who stump up to make this journey will forever hold a trump card to play against the inevitable dinner party braggarts. All content (c) Copyright Roderick Eime. Travel theme. Theme images by A330Pilot. Powered by Blogger.